Never happy with how things are on their own, I decided to customize my Ikea Expedit shelving to create something a little more my style. Thanks to D. Lawless hardware I was able to get the custom look I was after. I received cup pulls and invisible spring hinges for review to help me complete the look. One of the biggest changes you can make to an outdated kitchen are new knobs and drawer pulls. It can be a quick change (less than an hour) to replace the hardware and you can get a whole new look. New knobs and pulls are quite affordable, and there are TONS of styles. For something more modern you could try something with a stainless finish or a vintage look with glass pulls. D. Lawless Hardware was the most affordable option I was able to find online with seemingly endless options for a new look for your furniture, kitchen, bathroom, or whatever needs a makeover. For my furniture DIY, I really like the look of the old printer’s drawer files. I decided to fake the look with slats of wood and new doors for my shelving. First, I framed out the shelving unit with 1×3’s. Then, I cut 1×4’s and attached them together in order to create the door. I was able to attach the door with the invisible spring hinges – you cannot see that it is a door, instead it looks to be multiple long drawers. For more info on this project – check out my post at DelightCreativeHome.com. The cup pulls from D. Lawless help complete the look of the vintage printer’s drawer. I love the new look – from modern and white to vintage and grey, I was excited that it was so easy to achieve the look. For more information about new hardware for your home from D. Lawless Hardware, check out their website. On their website they have many products that feature photos of the items in use, this makes for tons of ideas on how to makeover your own furniture! i like this, i thought is was drawers and could not figure out how you put drawers on these shelves, pretty neat idea. Very nice idea! I would never remember that they weren’t drawers…I would always pull on them! Love your after pictures. Wow, what a difference that made! I love the after picture!! The end result is amazing, better than the before. 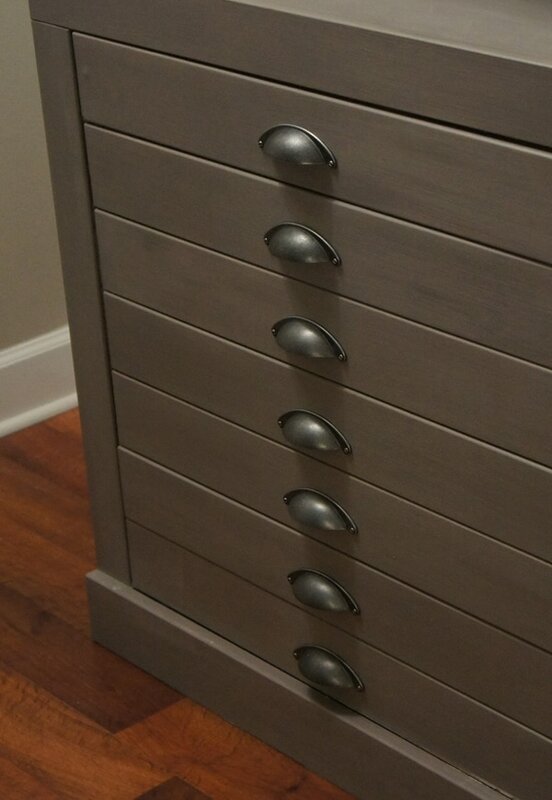 It is all on the handles (and fake drawers)! wow this looks really great!!!!! WOW doesn’t even look like the same piece of furniture!! What an awesome makeover!! I have said many times, it’s so easy to make a big change by adding or changing the hardware. Proof right here. It looks like a completely different piece of furniture! You did an awesome job! LOVE that transformation. looks much better!! Wow, I never would have guess that that is the same piece of furniture. You did a great job on the re-do. I need all new hardware for my kitchen and bathroom cabinets. YOu did such a great job! I would have never thought it was the same piece of furniture. Awesome! I would never have guessed it was the same piece!! AWESOME job!! The transformation of that is amazing! The color is great and the drawer pulls are awesome. I really like . Great job! That looks great! When you are free to stop by my house and help me update a few things? Wow that is so impressive, what a huge difference, looks beautiful! Holy crap that looks good! Seriously that is one of the nicest DIY projects I’ve seen in a while! Wow! That looks awesome… the colors really go well together too! Wow! What a transformation! It doesn’t look like IZEA furniture at all anymore! I love your before and after! NICE job!!! =) Cute handles too! What a great makeover. Love the after look! I love the makeover! The new drawer pulls are fantastic. vintage looking but still modern and fun.